Convict S. J. Frooman was killed in 1909 while fighting a huge fire in the Jute Mill at San Quentin State Prison. Research is underway for more information. See below - Retired Larkspur Fire Chief and Historical Committee member Bill Lellis discovered the convict's name in April of 2016 through newspaper research. Note also that Larkspur FD responded mutual aid - a thank you letter from San Quentin to Larkspur will be posted soon. SAN QUENTIN. March 5.— An honorable burial, the reward for an honorable death, will be accorded S. J. Frooman, a convict who died in the prison hospital this afternoon from Injuries received while bravely fighting the fire in the penitentiary last Wednesday. Frooman, displayed a reckless gallantry during that exciting period. When the call came for volunteers he was among the first to step out. It was his one opportunity to retrieve his dishonored name, to clear himself of the taint of a criminal being, to take his place as a man among men. It was his chance and he took It. For a few moments he lifted himself from out the slough of his debased position and then died. While yet he lived in honor a merciful Gatling gun fell upon him, crushing him to his death. He lived in dishonor, but died a man, and for his manner of death will be burled as a man. in San Rafael cemetery, not as a criminal in a convict grave. This will be the only satisfaction to his wife and daughter, who are in Europe and unaware of his crimes and his death. He was convicted for forgery and would have been released in 1911. The' expenses of his funeral will be paid by the guards of the prison. Evidence of the fire-which occurred In the Jute Mill of the prison Wednesday has disappeared. The bundles of jute ceased to smolder this afternoon and the convicts have been spreading the water soaked and partially burned material In. the prison yard. Warden Hoyle declared tonight that the loss will reach $40,000. S. J. Frooman, the convict who broke his leg and was otherwise badly crushed while fighting the fire that threatened the destruction of the state penitentiary here last Wednesday, died today as a result of his injuries. Frowman was injured while dragging a gattling gun out of the flames." Note from Editor: The Gatling gun (proper spelling) is one of the best-known early rapid-fire weapons and a parent of the modern machine gun. 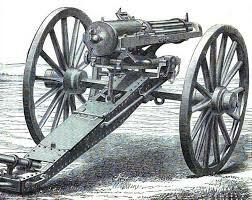 Invented by Richard Gatling, it was first used in the 1860’s by the Union Army during the Civil War. A Gatling gun used in the Civil War mounted on a cart. The San Quentin one was probably mounted on a tripod. ​The document below is from the annual report to the State from the Prison Directors covering the years 1909-1910. This excerpt of four pages includes the San Quentin Warden's Report, and the San Quentin Captain of the Guards Report. While the fire and death is described, the convicts name is not written in the report. SCROLL Through Document Below to read the cover and four related pages.